FR-280m Mule Signatures of Elliott & White. One of the most popular Large Size Type notes displays the portrait of Ta-to-ka-in-yan-ka also known as Chief Running Antelope. He was the chief of the Oncpapa or Huncpapa Tribe of the Sioux Nation. George F. Smille, who engraved many of our most beautiful pieces of currency, engraved the portrait and requested the Chief wear his war bonnet. He refused, deeming it inappropriate, so a war bonnet from the opposing Pawnee Nation was substituted in the engraved portrait. 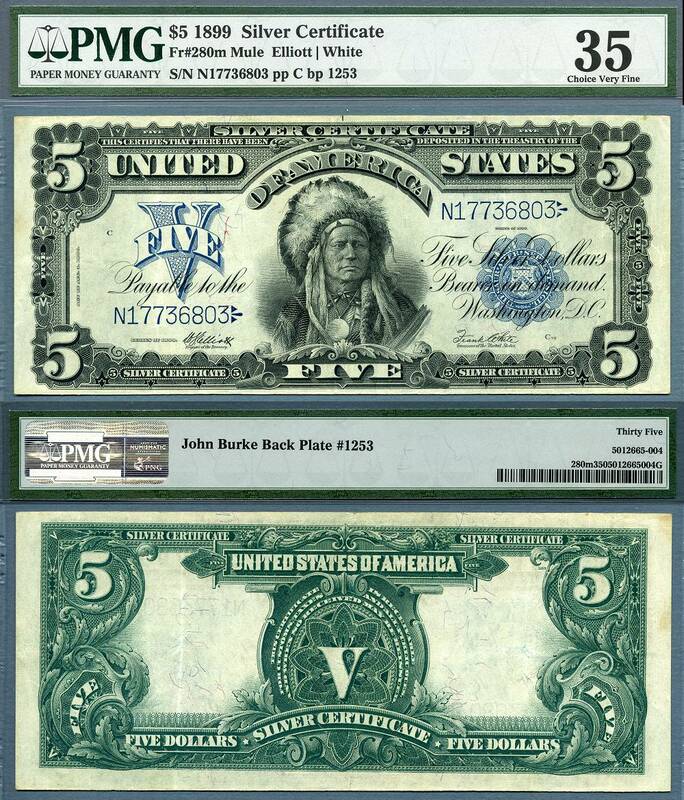 This $5 silver certificate is the only piece of US paper money issued for general circulation that uses a Native American as the central vignette.